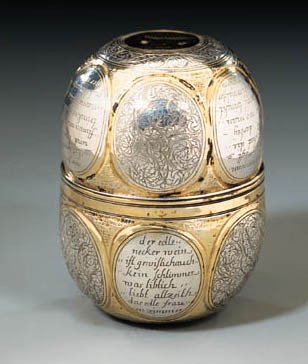 AUGSBURG, CIRCA 1690, MAKER'S MARK R (M. ROSENBERG DER GOLDSCHMIEDE MERKZEICHEN, FRANKFURT, 1922, III, NO. 681, UNRECORDED BY SELING). 3¾ in. (9.5 cm.) high overall; 27/8 in. (7.5 cm.) diam. 1913 Bath House Inventory, p. 36, no. 199, in the Red Room, in the 'large glazed case near door - Right Hand Division'. 1914 Wernher Inventory, p. 36, no. 188.